This festive Christmastime river cruise begins in Nuremberg, the unofficial capital of the Holy Roman Empire. Guided sightseeing shows you its historical treasures, as well as Old Town, illuminated with holiday lights and decorations. There’s plenty of time to visit the Christmas market, one of the most famous in Germany, and be sure to savor some traditional lebkuchen (spicy gingerbread), a specialty of Nuremberg. Next stop is delightful Bamberg, a UNESCO World Heritage Site. Here, throughout town, you’ll see nativity scenes built by local citizens. 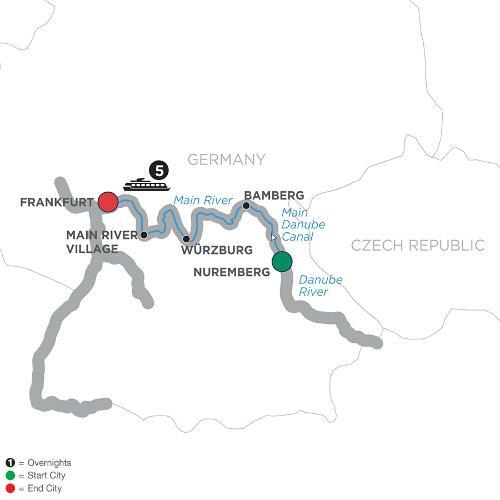 Learn about Christmas traditions as you cruise to charming Würzburg, known as the “Pearl of the Romantic Road,” and surrounded by sloping hills covered with vineyards. Walk through the halls of the ornate Bishop’s Residenz—home to the largest ceiling fresco ever painted, then stroll through the Christmas markets while you sip Glühwein (hot mulled wine). Learn how to bake a traditional cookie before arriving at one of the charming small towns with half-timbered houses and narrow streets that are dotted along the Main River. Take a guided walk of one of these picturesque Bavarian villages—sure to be even more appealing lit up with festive lights and decorations. As this unforgettable Europe river cruise ends in Mainz, you will never forget the historical treasures of Germany perfectly paired with the sights, sounds, and tastes of the joyous holiday season. Gateway city for departure is Frankfurt, Germany.